Today, on the UK Column News, Mike covered the House of Commons debate on the UK’s money supply – the first such HoC debate in over a hundred years. This is a subject that the folks at Positive Money have been pushing to have debated in the HoC for ages and yesterday, they finally got their wish. Unfortunately, Mike said he couldn’t support Positive Money, I guess because the UK Column is calling for the return of the Bradbury Pound. But both Positive Money’s approach and the UK Column have a common purpose, if you like: sound money. While I admire Mike and the UK Column and greatly appreciate the work that the UK Column does, may I respectfully suggest that supporting organisations on issues on which we can find solid points of agreement is essential if we are to build strong alliances – and win. For instance, not everyone in a party agrees on every issue and it is possible to have people within it whose views are virtual polar opposites in some policy areas but coalesce perfectly on others. The reason people coalesce to form a party is so that they can use their collective strengths and individual strengths to fight for some general, common principle. They are not ideological clones of one another, but they can agree where it counts. What counts is that Positive Money is heading in the right direction and is having some success. So I urge the UK Column to support Positive Money because we are brothers in arms: we might not agree with them on everything, but they are going in the right general direction and we should support them on the issues they raise with which we agree. The Powers That Be got the world to where it is via tiny increments. We need to be able to learn from our enemies and find common ground and new friends where we can. Why not meet them half way? So now we are to have secret police? our secret courts, which operate outside of public scrutiny and which are entirely unaccountable. Given the massive body of complicated law that we now have in this country, and that we are probably deemed to have broken the law umpteen times on a daily basis, are we are now to be entrapped going about our daily business by secret police? So Cameron’s gripe is that the enormous bill was presented “suddenly”. He says he is not paying that bill, but qualifies his statement with “on December 1”. Thus, he has left himself an escape route which, if he is true to form, he will use. 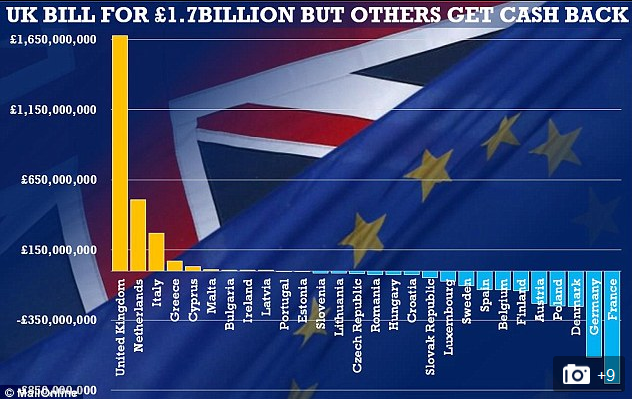 PS: It is clear, from the Mail’s graph below, that by loading the majority of the budget increase onto a small minority of countries, the EU Commission is counting on there being no support amongst member states for Cameron’s ‘fight’ against it. The allocation has Britain so spectacularly out in front as the major contributor that it looks more like a snooker: the EU Commission is counting on there being next to no support for a Cameron bid for a rethink. This should test Cameron’s mettle and EU leanings. Below are “UKIP’s policy announcements as made at the Doncaster Conference“, pertaining to “what a UKIP Government will do”. (More detailed to follow before the 2015 GE). I’ve changed the formatting a bit because WordPress made a mess of it. There’s a lot to pore into, which I hope to do in the coming days, ailments permitting! We would review all legislation and regulations from the EU (3,600 new laws since 2010) and remove those which hamper British prosperity and competitiveness. We would negotiate a bespoke trade agreement with the EU to enable our businesses to continue trading to mutual advantage. UKIP would not seek to remain in the European Free Trade Area (EFTA) or European Economic Area (EEA) while those treaties maintain a principle of free movement of labour, which prevents the UK managing its own borders. We would reoccupy the UK’s vacant seat at the World Trade Organisation, ensuring that we continue to enjoy ‘most favoured nation’ status in trade with the EU, as is required under WTO rules. UKIP will increase personal allowance to the level of full-time minimum wage earnings (approx £13,500 by next election). Inheritance tax will be abolished. We will introduce a 35p income tax rate between £42,285 and £55,000, whereupon the 40p rate becomes payable. UKIP will set up a Treasury Commission to design a turnover tax to ensure big businesses pay a minimum floor rate of tax as a proportion of their UK turnover. UKIP will leave the EU and save at least £8bn pa in net contributions. UKIP will cut the foreign aid budget by £9bn pa, prioritising disaster relief and schemes which provide water and inoculation against preventable diseases. UKIP will scrap the HS2 project which is uneconomical and unjustified. UKIP will abolish the Department of Energy and Climate Change and scrap green subsidies. UKIP will abolish the Department for Culture Media and Sport. UKIP will reduce Barnett Formula spending and give devolved parliaments and assemblies further tax powers to compensate. UKIP will introduce an option for students to take an Apprenticeship Qualification instead of four non-core GCSEs which can be continued at A-Level. Students can take up apprenticeships in jobs with certified professionals qualified to grade the progress of the student. Subject to academic performance UKIP will remove tuition fees for students taking approved degrees in science, medicine, technology, engineering, maths on the condition that they live, work and pay tax in the UK for five years after the completion of their degrees. UKIP will scrap the target of 50% of school leavers going to university. Students from the EU will pay the same student fee rates as International students. UKIP supports the principle of Free Schools that are open to the whole community and uphold British values. Existing schools will be allowed to apply to become grammar schools and select according to ability and aptitude. Selection ages will be flexible and determined by the school in consultation with the local authority. Schools will be investigated by OFSTED on the presentation of a petition to the Department for Education signed by 25% of parents or governors. We will resource fully our military assets and personnel. UKIP will change the points system for social housing to give priority to ex-service men and women and those returning from active service. A Veterans Department will bring together all veterans services to ensure servicemen and women get the after-service care they deserve. Veterans are to receive a Veterans’ Service Card to ensure they are fast tracked for mental health care and services, if needed. All entitlements will be extended to servicemen recruited from overseas. UKIP supports a National Service Medal for all those who have served in the armed forces. UKIP will ensure the NHS is free at the point of delivery and time of need for all UK residents. We will stop further use of PFI in the NHS and encourage local authorities to buy out their PFI contracts early where this is affordable. We will ensure that GPs’ surgeries are open at least one evening per week, where there is demand for it. UKIP opposes plans to charge patients for visiting their GP. We will ensure that visitors to the UK, and migrants until they have paid NI for five years, have NHS-approved private health insurance as a condition of entry to the UK, saving the NHS £2bn pa. UKIP will commit to spending £200m of the £2bn saving to end hospital car parking charges in England. We will replace Monitor and the Care Quality Commission with elected county health boards to be more responsive scrutineers of local health services. These will be able to inspect health services and take evidence from whistle-blowers. UKIP opposes the sale of NHS data to third parties. We will ensure foreign health service professionals coming to work in the NHS are properly qualified and can speak English to a standard acceptable to the profession. UKIP will amend working time rules to give trainee doctors, surgeons and medics the proper environment to train and practise. There will be a duty on all health service staff to report low standards of care. UKIP recognises the benefits of limited, controlled immigration. UKIP will leave the EU, and take back control of our borders. Work permits will be permitted to fill skills gaps in the UK jobs market. We will extend to EU citizens the existing points-based system for time-limited work permits. Those coming to work in the UK must have a job to go to, must speak English, must have accommodation agreed prior to their arrival, and must have NHS-approved health insurance. Migrants will only be eligible for benefits (in work or out of work) when they have been paying tax and NI for five years and will only be eligible for permanent residence after ten years. UKIP will reinstate the primary purpose rule for bringing foreign spouses and children to the UK. UKIP will not offer an amnesty for illegal immigrants or those gaining British passports through fraud. UKIP will return to the principles of the UN Convention of Refugees which serves to protect the most vulnerable. UKIP will target foreign aid at healthcare initiatives, inoculations against preventable diseases and clean water programmes with a much-reduced aid budget administered by the Foreign Office. British organisations will be offered the contracts to deliver the remaining aid following removal of the EU Procurement Directive. UKIP will repeal the Climate Change Act 2008 which costs the economy £18bn a year. UKIP supports a diverse energy market including coal, nuclear, shale gas, geo-thermal, tidal, solar, conventional gas and oil. We will scrap the Large Combustion Plant Directive and encourage the re-development of British power stations, as well as industrial units providing on-site power generation. UKIP supports the development of shale gas with proper safeguards for the local environment. Community Improvement Levy money from the development of shale gas fields will be earmarked for lower council taxes or community projects within the local authority being developed. There will be no new subsidies for wind farms and solar arrays. UKIP will abolish green taxes and charges in order to reduce fuel bills. By leaving the EU, the UK will leave the Common Agricultural Policy. Outside the EU UKIP will institute a British Single Farm Payment for farms. UKIP will let the British parliament vote on GM foods. UKIP will leave the Common Fisheries Policy and reinstate British territorial waters. Foreign trawlers would have to apply for and purchase fishing permits to fish British waters when fish stocks have returned to sustainable levels. Food must be labelled to include the country of origin, method of production, method of slaughter, hormones and any genetic additives. UKIP opposes the bedroom tax because it operates unfairly, penalising those who are unable to find alternative accommodation and taking insufficient account of the needs of families and the disabled. Child benefit is only to be paid to children permanently resident in the UK and future child benefit to be limited to the first two children only. UKIP will ensure there is an initial presumption of 50/50 shared parenting in child custody matters and grandparents will be given visitation rights. UKIP supports a simplified, streamlined welfare system and a benefit cap. UKIP opposes tolls on public roads and will let existing contracts for running toll roads expire. UKIP will maintain pensioner bus passes. UKIP will require foreign vehicles to purchase a Britdisc, before entry to the UK, in order to contribute to the upkeep of UK roads and any lost fuel duty. UKIP will ensure that speed cameras are used as a deterrent and not as a revenue raiser for local authorities. UKIP will protect the Green Belt. Planning rules in the NPPF will be changed to make it easier to build on brownfield sites instead of greenfield sites. Central government is to list the nationally available brownfield sites for development and issue low-interest bonds to enable decontamination. Houses on brownfield sites will be exempt from Stamp Duty on first sale and VAT relaxed for redevelopment of brownfield sites. Planning Permission for large-scale developments can be overturned by a referendum triggered by the signatures of 5% of the District or Borough electors collected within three months. UKIP will overcome the unfairness of MPs from devolved nations voting on English-only issues. UKIP supports the recall of MPs as was originally promised in the Coalition Agreement, whereby 20% of the electorate in a constituency must sign a recall petition within eight weeks. The approval of MPs will not be required to initiate a recall petition. UKIP will introduce the Citizens’ Initiative to allow the public to initiate national referendums on issues of major public interest. UKIP will withdraw from the jurisdiction of the European Court of Human Rights. UKIP will reverse the government’s opt-in to EU law and justice measures, including the European Arrest Warrant and European Investigation Order. We will replace the EAW with appropriate bi-lateral agreements. UKIP will not give prisoners the vote. UKIP believes that full sentences should be served and this should be taken into account when criminals are convicted and sentenced in court. Parole should be available for good behaviour on a case-by-case basis, not systematically. We will repeal the Human Rights Act and replace it with a new British Bill of Rights. The interests of law-abiding citizens & victims will always take precedence over those of criminals. UKIP recognises and values an overarching, unifying British culture, which is open and inclusive to anyone who wishes to identify with Britain and British values, regardless of their ethnic or religious background. Official documents will be published in English and, where appropriate Welsh and Scots Gaelic. We will review the BBC Licence Fee with a view to its reduction. Prosecution of non-payments of the Licence Fee would be taken out of the criminal sphere and made a civil offence. UKIP will amend the smoking ban to give pubs and clubs the choice to open smoking rooms properly ventilated and separated from non-smoking areas. UKIP opposes ‘plain paper packaging’ for tobacco products and minimum pricing of alcohol. Businesses should be able to discriminate in favour of young British workers. Repeal the Agency Workers Directive. Encourage councils to provide more free parking for the high street. Simplify planning regulations and licences for empty commercial property vacant for over a year. Extend the right of appeal for micro businesses against HMRC action. In Cameron’s speech to the Conservative Party conference today, he stated that he wants lower corporate taxes in the UK than other countries. If they owe the money, then can’t you take them to court for not paying, Mr Cameron? Oh, the law doesn’t allow you to do that? Well then, why not change the law? Oh, because the corporations won’t pay into Conservative Party coffers? Cameron has given the corporations tax breaks at the expense of the ordinary man, whose business has been undercut by those very corporate tax breaks. And yet the ordinary man is not asked nicely to pay: he pays or goes to jail. Cameron’s “Now you must pay what you owe” line is pure PR BS. And about those zero hours contracts that Cameron says he will scrap – the ones which his government brought into being: why doesn’t he scrap them now? Why did he allow them to proliferate in the first place, if not to massage the employment figures in the most dishonest way possible? Allegedly, Lord Janner is suffering from dementia, so police can’t interview him about alleged child abuse that he was involved in. According to the Mail, “Police ‘told to limit abuse probe into MP’: Derbyshire Chief Constable claims he was forbidden to arrest Labour man or search his home when he worked as a detective“. Might we assume that he is also too feeble to turn up to the House of Lords to collect his attendance allowance, or to vote on issues which affect us all? Apparently not because Lord Janner voted a number of times in 2013 – less than a year ago. His full HoL voting record can be seen here. If this man is fit enough to attend the HoL, then he should be fit enough to be interrogated by the police and made to answer for any child abuse that he might have committed. Are Labour and Conservative ‘leaders’ both aiming for a hung Parliament? Both Labour and Conservative conferences have been flaccid, dull and depressing – not just in delivery and format, but in drive. I agree. I believe LibLabCon are worried about UKIP gaining seats. The Tories, because their backbenchers would only countenance a coalition with UKIP – not the Lib Dems. Since the LibDems are likely to lose most of their seats (or a serious loss in their numbers), they are unlikely to be kingmakers. So Lab and Con don’t have a potential coalition partner unless they team up with UKIP and teaming up with UKIP means their being unable to ram through EU legislation. That’s why I think Lab and Con are engineering a hung parliament – so that they can go into some kind of formal or informal coalition with each other on EU matters. We’ve seen this happen on many occasions – the current government has relied upon Labour votes to ram bills through Parliament that the majority of Conservative MPs were very unhappy about.